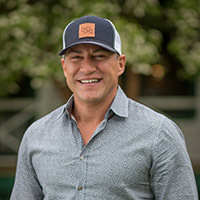 A native of Colorado, Jeff Buerger joined Hall and Hall as a ranch partner in 2003 bringing with him 10 years of experience and education in the ranch brokerage business. Considering himself a “hybrid” ranch broker, Jeff comes from a true Colorado mountain ranching family and has genuine on-the-ground knowledge of traditional working ranches as well as various recreational amenities associated with them. An avid fly-fisherman, big game, and upland bird hunter, Jeff considers it a privilege to have a ranch background and wishes to continue his stewardship for agricultural and recreational purposes through Hall and Hall. Jeff earned degrees in business administration and management and holds real estate licenses in several states. Featuring 2 miles of private tailwater fishing on the Taylor River, Wilder is a preservation oriented 2,100± acre shared ranch community 25 minutes from Crested Butte and 20 minutes from Gunnison. Co-listed with Doug Duryea, Crested Butte Resort Real Estate. Gorgeous 600± acres in national forest between Boulder and Rocky Mountain National Park. Undulating forest/meadows, extensive creeks, springs. Vested County approvals for large improvements on choice sites. Rare close-in opportunity. Combining 5+ miles of outstanding fly fishing on the coveted White River, 4,603± acres of magnificent mountain scenery, and impeccable accommodations and facilities, Westlands has hosted and impressed distinguished guests for decades. Berrien Ranch, minutes from Evergreen, offers 456± acres of mountain land with direct access to Highway 73 and is one of the last remaining large acreage offerings within 35 minutes of Downtown Denver.